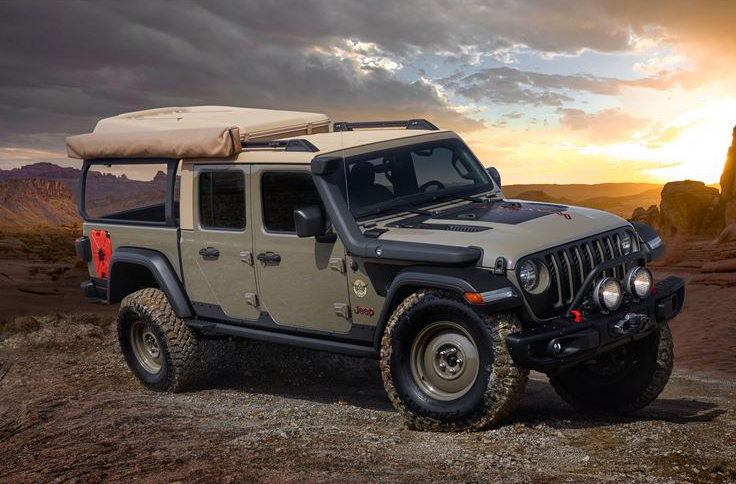 The Jeep and Mopar brands have joined forces to create six custom-built concept vehicles for the 53rd Easter Jeep Safari. The annual event kicks off on 13 April and runs until 21 April in Moab, Utah, and the event will see thousands of off-road enthusiasts make their way to Moab for a week of technical off-roading in some of the most challenging but scenic terrain in the country. “The Moab Easter Jeep Safari provides the perfect venue to interact with and gather feedback from our most loyal and passionate customers – the diehard off-road enthusiasts who attend each year,” said Tim Kuniskis, Head of Jeep Brand for North America, “This year’s Safari will mark the debut of the highly anticipated all-new Jeep Gladiator on Moab’s scenic and demanding trails. To celebrate, we are showcasing six fun and ultra-capable new truck-based Jeep concept vehicles that are certain to turn heads and delight the crowd”. Jeep Performance Parts, with their wide selection of current and prototypes parts will be part of the highlight in this year’s collection of Jeep concept vehicles. All Jeep Performance Parts are made by Mopar and adhere to rigorous specifications and 4x4 capability. These parts give Jeep owners the chance to enhance their current vehicles with confidence. “Customisation is one of the highest priorities for Jeep brand enthusiasts. This is why we have proactively developed a portfolio of more than 200 exclusive parts and accessories for the all-new Jeep Gladiator”, said Steve Beahm, Head of Parts and Service at Mopar and Passenger Car Brands for FCA North America, “This portfolio is backed by a factory warranty and has been put through tens of thousands of hours of development, testing and validation, providing our customers a great array of products and peace of mind. At the 2019 Easter Jeep Safari, we will be inspiring our customers by showcasing just a fraction of what is currently available in our catalogue and also some conceptual accessories that might make it into production in the near future”. The Jeep Wayout concept takes advantage of the all-new Gladiator’s class-leading payload to allow adventurers to venture far off the beaten path. This functional concept vehicle sports a full roof-top tent with a custom large sprawling canopy. The body is fixed with exterior features like a new Gator Green shade that will be available for new Gladiator models. It also features a bed rack with an integrated ladder that carriers the roof-top tent. The tent can comfortably sleep two people, while the 270-degree awning with amber LED task light helps you set up when the sun goes down. There are also two custom-fit auxiliary fuel tanks that are integrated into the bedsides, with an ARB on-board air system and body-mounted quick-disconnect air supply line that allows you to travel even further off the map! The vehicle also boasts a Jeep Performance Parts 2-inch lift kit to increase ground clearance on top of the 17-inch steel wheels with 37-inch mud-terrain tires. This gives the vehicle a retro feeling. A 12-000lb warm winch and Jeep Performance Parts snorkel has also been added to assist multiple wet and dry obstacles. 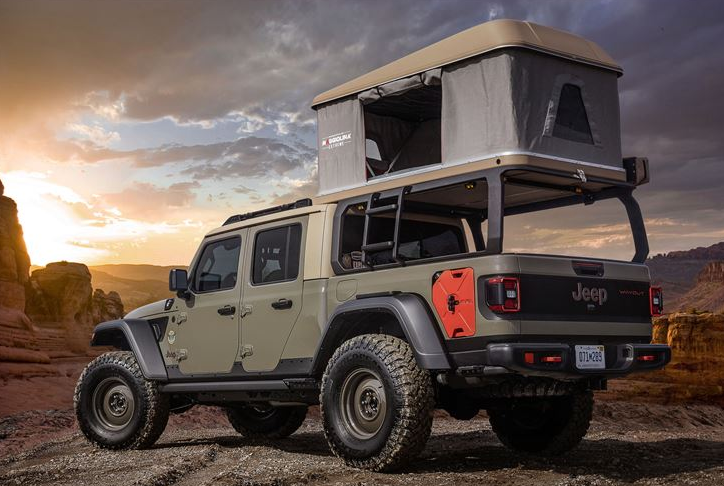 The Jeep Wayout also sports a custom integrated roof-rack system for any gear you might pack up top, and the truck bed houses a Mopar/Decked bed-drawer system for extra lockable dry storage. The inside has bed-lined floors with trimmed brown leather seats and laser-etched inserts of topographical maps give this concept vehicle an even new look! This all-round adventurer is powered by an award-winning 3.6-litre Pentastar V6 engine and malted to an eight-speed automatic transmission. 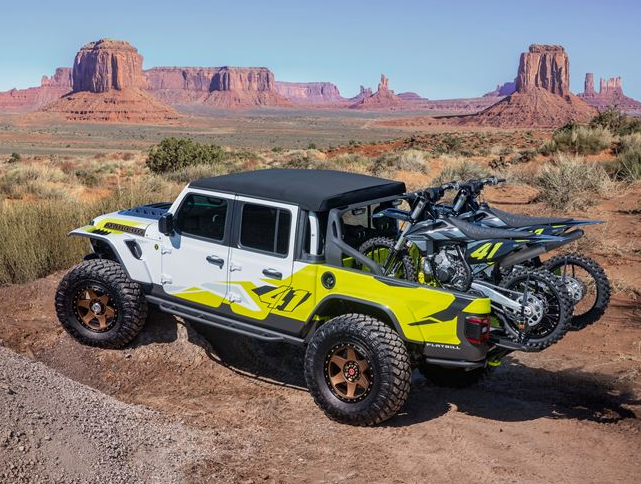 The Jeep Flatbill concept takes the desert lifestyle look and creates another fun concept of the all-new Gladiator but mixes it with the extreme thrills of the Motocross world. This results in a loud and rowdy look that is the epitome of the ultimate hauler for toys. The exterior features Motocross inspired parts with a vented carbon hood and high clearance flares, and a custom-designed shortened front bumper with skid plate to improve the approach angle. This concept vehicle is a truck that is dedicated to dirt bike riding and is fully equipped to transport these bikes to any off-road adventure. The Flatbill’s truck bed actually has a pair of dirt bikes that are ready for the road. The tailgate has been removed, and dedicated wheel ramps have been installed that slide out to create easy access for loading those bikes and toys. There is also custom body work on the bed lowers, and the addition of a tube rear bumper. This aids in increasing the departure angle. The Flatbill is kitted with Dynatrac Pro-Rock 60 front and rear axles with an Off-Road Evolution custom 4-inch lift kit to help it tackle any challenge. Large rear bypass shocks along the 20-inch wheels have been added as well as 40-inch tires which is a first on any Jeep Gladiator, to push the off-road performance and provide superior traction. The bright bed-lined floors and custom-trimmed seats give the vehicle a sporty environment on the inside. This concept Jeep Flatbill is powered by a 3.6-litre Pentastar V6 engine and a cold-air Mopar intake and an eight-speed automatic transmission. The Easter Jeep Safari tradition of “Resto-Mods” is carried through with the Jeep M-715 Five-Quarter – a seamless combination of vintage and traditional elements. The “Five-Quarter” is symbolically a nod to Jeep trucks of the past that were one and one-quarter tons. This Gladiator-based military vehicle started in 1968 with the M-715 and was redesigned with more functional components like improvements to the chassis, drivetrain and cargo configurations, all resulting in an incredibly capable showstopper. The original front sheet metal on the exterior has been replaced with a full carbon-fibre front end. It also boasts an all-new 6-foot custom-fabricated aluminium bed that has been perforated and redesigned with a mix of water jet cut panels and wood slats. Other body modifications are a 3.5-inch drop to its convertible soft-top, and some more enhancing of its factory monster truck silhouette. The headlights have been replaced with new HID lights along with LED auxiliary lights for outward visibility. The LED halo lights on the rear have been installed with original tail light buckets. The body is being protected by functional rock rails that run the length of the body. Another element that complements the brushed metal-finished body is the modified front Jeep Gladiator Rubicon steel bumpers. The off-road capability of the M-715 Five-Quarter is further enhanced with a reinforced original frame that replaces the leaf springs with a heavy-duty link/coil suspension system. The front axle has been replaced with a Dynatrac Pro-Rock 60 front axle and has also been pulled forward two inches. The rear axle sports a Dynatrac Pro-Rock 80 axle, with 20-inch beadlock wheels that are wrapped with large 40-inch tires. The interior has new Jeep Wrangler seats with no headrests to create a sleek and low-back visual, with water-jetting aluminium components that make up a new lightweight and premium instrument panels and door panels. A repurposed 8-71 supercharger encases the transmission, while the floors have been bed-lined for added durability. The Jeep M-715 Five-Quarter gets its power from a 6.2-litre supercharged “Hellcrate” HEMI V-8 engine that delivers more than 700 horsepower (more than 520kW). Taking a mix of classic Jeep Truck styles from the late 1970s, the Jeep J6 concept is an all-truck with prototype and production from Jeep Performance Parts from Mopar. The Rubicon customised two-door configuration maximises cargo space with a large six-foot functional bed box area that is also 12-inches longer than the standard Jeep Gladiator bed. The Jeep Design team, together with Mopar, went back in time for the Metallic Brilliant Blue paint on this concept that pays homage to the exterior look of the 1978 Jeep Honcho. The length of the J6 is 201-inches and the wheelbase come out at 118.4-inches, matching it with that of the current Jeep Wrangler 4-door. The bed area has been upsized and has a prototype body-colour matching spray-in bedliner. A durable two-and-a-quarter-inch steel prototype sport/roll bar has been planted in the bed and carries a set of four 5-inch Jeep Performance Parts LED lights that shine at 4,800 lumens each. A spare tire carrier can store up to a 37-inch tire. The vehicle also sports Prototype 17-inch beadlock wheels and has a “deep dish” design that create a set off from the Metallic Brilliant Blue body with a Brass Monkey finish that is encircled by a silver beadlock ring. A Jeep Performance Parts 2-inch lift kits has been added with 37-inch tires to add extra tail clearance. There are also some additional modifications that assist the Jeep J6 when it comes to off-road obstacles that include a prototype 2-inch steel stinger bar that is bolted to the Rubicon front bumper and rock rails that are customised with 2-inch steel tubes that welded to the standard Jeep Gladiator rails. The hard top can be removed and the Jeep J9 badge can be found of the tailgate and side fenders. There are four extra 5-inch Jeep Performance Parts LED lights that are mounted on the stinger bar, with another two bolted close to the A-pillars. These lights work together to light up the trail ahead. 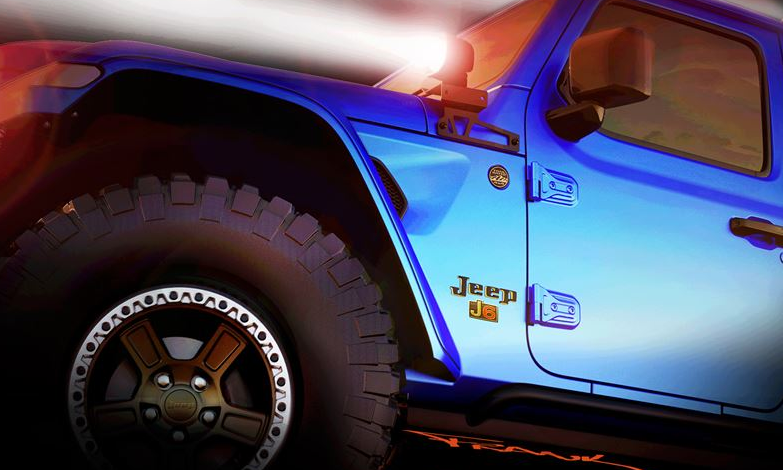 The concept vehicle has a Mopar Satin Black grille, and the Jeep Gladiator Rubicon hood has Mopar hood latches that feature the Jeep logo. The engine – 3.6-litre – also gets a performance boost with Jeep Performance Parts cold-air intake and dual cat-back exhaust. The exterior flows into the interior of the Jeep J6, with the instrument panel inserts and body colour matching. The Katzkin leather seats and armrests have the same body-colour blue stitching. A classic Jeep badge adorns the horn pad, and the auxiliary switch bank offers a central operating location for the 10 LED lights. The trailer brake control switch can tap into additional stopping power, with a bright pedal kit. It also has all-weather floor mats and moulded door sill guards with the Jeep logo. 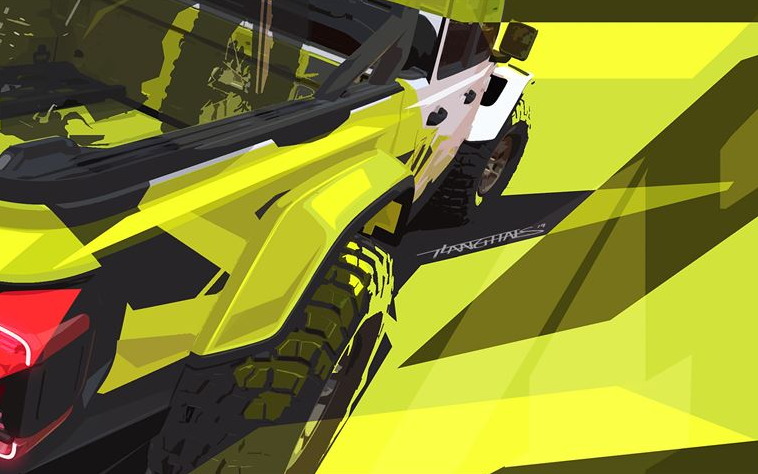 This heritage inspired concept carries a throwback colour palette and graphics of the CJ Scrambler, with a mix of Jeep Performance Parts that are currently available and some conceptual touches. The early 1980’s CJ8 Scrambler has been recreated with this prototype in Punk’N Metallic Orange and Nacho body-side stripes that run from the front panels through to the bed and dons a matching hood graphic. The exterior is white and crowned with top in vintage amber to carry through the retro feel. A spray-in bedliner and 2-inch steel prototype tube sport/roll bar fills the bed area, painted in body-colour white. This version of the sport/roll bar attaches to the bed and extends the length of the bed rails of each side. This showcases eight tie-down points to lock down cargo. LED task lights are mounted to the sport/roll bar and directed to the rear bed for illumination in the cargo area. The Scrambler is also based on the Jeep Gladiator Rubicon and pulls from the Mopar brand’s Jeep Performance Parts line. Included in the vehicle is a set of four 5-inch LED light just above the sport/roll bar, and two are on the vehicle’s A-pillars, showing the way at 8000 lumens each. Jeep Performance Parts 17-inch slot wheels are made in a concept bronze to tie in with the colour theme and a 2-inch Jeep Performance Parts lift kit assists with the 37-inch tires and Jeep Performance Parts rock rails sport a non-slip grip. It gets its power from the 3.6-litre engine with Mopar cold-air intake and cat-back exhaust. The colour theme is continued through in the interior with Katzkin Amaretto Brown leather seats, bordered in orange thread, with the Jeep grille logo in a light Tungsten on the seatbacks. The same Katzkin Amaretto Brown leather with orange thread is also found on the dash panel and armrests. The auxiliary switch bank has a single location for operating accessories like the LED lights. The Mopar bright pedal kit and all-weather floor mats add an extra touch to the interior. 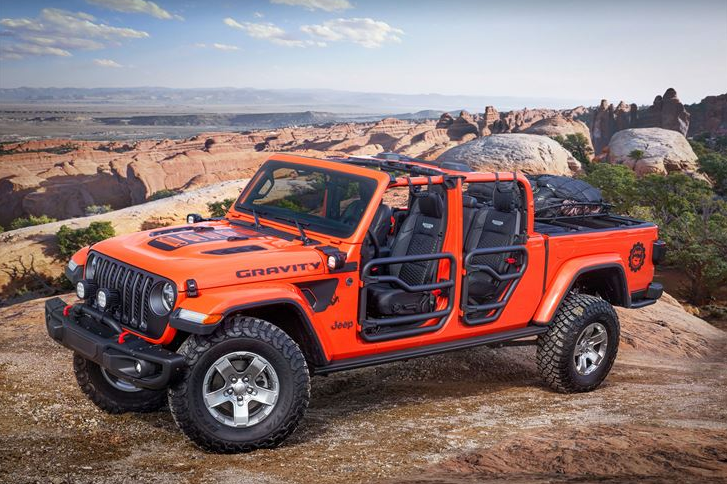 This aimed at rock climbing themed Jeep Gladiator Gravity concept is taken to a new level with a full range of currently available Jeep Performance Parts from Mopar for adventurers who have a desire to reach greater heights. This concept Jeep Gladiator Rubison sports a bright Punk’N Metallic Orange and is ready to show how Jeep Performance Parts can enhance the pickup’s capability and versatility. Mounted Mopar cross rails work with a cargo carrier basket in the bed area to give extra storage space for rock-climbing gear. A one-of-a-kind Mopar/Decked bed storage system gives extra lockable cargo space with duel sliding drawers and still allows for storage on top in the bed area. Jeep Performance Parts 2-inch round steel tube doors and a mesh sunbonnet gives cover while keeping the top-down feel to give the a truly open-air potential to the vehicle. The Jeep Gladiator Gravity is raised with the Jeep Performance Parts 2-inch lift kit and has 17-inch gear wheels with 35-inch tires. The vehicle also has steel Jeep Performance Parts rock rails that are thicker and wider and have the same powder-coating on the Ram Truck bedliners with a non-slip finish. The front has a Mopar satin black grille with Jeep Performance Parts 7-inch LED lights to show the way, as well as 5-inch LED lights on the A-pillars. The vehicle has a cold-air intake and cat-back exhaust system that enhances the engine output. Katzkin leather seats that feature the Jeep grille logo in Tungsten stitching dress up the interior of the vehicle, with additional Mopar accessories like grab handles stamped with the Jeep grille logo, MOLLE bags for storage and all-weather mats with a plug system that slows for draining of water and debris rounds off the interior. The Jeep brand is built on more than 75 years of heritage as well as being the authentic SUV with class-leading capability, craftsmanship, and versatility. Aimed at the person who seeks extraordinary adventures and journeys. The brand has an open invite for everyone who wants to live life to the fullest with a full range of vehicles that continue to provide owners with the confidence to handle any challenge with confidence. The Jeep vehicle range includes the Cherokee, Compass, Gladiator, Grand Cherokee, Renegade and Wrangler. To meet the customer demand, all models sold outside North America come in both left and right-hand drive configurations with gasoline and diesel powertrain options. Mopar – coming from the words MOtor and PARts – is the service, parts and customer car brand for FCA vehicles around the world. Started in 1937 as the name of a brand of antifreeze products, Mopar has evolved and now represents complete car and authentic performance for owners worldwide. Today Mopar’s global reach distribute more than 500 000 parts and accessories in over 150 markets around the world. The Jeep Performance Parts portfolio was created in 2012 and offered by the Jeep brand. It provides customers with high-end, hard-core quality aftermarket accessories and performance parts. The line-up includes lift kits, bumpers, winches, skid plates, suspension components and so much more. The annual Easter Jeep Safari has trails rides and day long trips that depart from Moab, Utah, and continue throughout the nine-day-long event. It was started in 1967 by the Moab Chamber of Commerce as a one-day trail ride. Over the years it continued to grow until it finally reached the current length. The culmination of the event remains on the “Big Saturday” event on the Saturday of Easter Weekend.